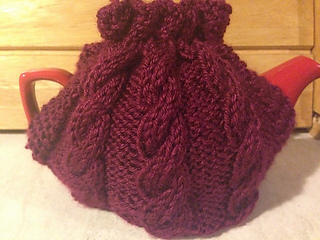 This tea cosy is ideal for the smaller teapots that are so popular at the moment. But it can easily be adapted for a larger teapot. The stitch pattern is in multiples of 11 with a knit 5 border. To make it larger cast on an extra 11 stitches and add an extra cable and purl section. Just make sure you ‘try it on’ your teapot once in a while. Pattern includes photographed steps of how to cable without a cable needle.